1. Preheat oven to 400 degreees. 2. Cut the spaghetti squash in half lengthwise and scrape out the seeds. 3. Brush flesh of squash with 2 tablespoons olive oil and season with salt and pepper. 4. Place the squash cut-side up on a baking sheet. 5. Bake for at least 50 minutes, until fork tender. 6. Once cooled, scrape the flesh of the squash out into a bowl or food storage container. 1. In a small saucepan, place the brown sugar with the fish sauce, tamarind pulp, soy sauce and Thai chili powder. 2. Bring to a simmer over low heat. Once the sugar has completely melted, remove the saucepan from heat and set aside. 1. Preheat oven to 350 degrees. Roast the raw peanuts for 8-10 minutes until aromatic. Set aside to cool. 2. Drain and dry the tofu thoroughly, using paper towels wrapped around the block, placing it between 2 weighted plates. Cut into bite-size pieces. 3. Cut the green onions into 2" pieces. 4. Set up to cook the first batch. Get the bean sprouts, crack an egg into a bowl, and measure out half of the vegetable stock. 5. Pulse the peanuts in a grinder or food processor until roughly chopped. Set some of the peanuts aside for a garnish, and place the rest into a bowl to be used in the Pad Thai during cooking. 6. Roll the lime, to ensure that the lime is juicy when you are ready to squeeze over your dish as a garnish. 1. Line up all your ingredients next to your wok. Remember to only use half of your ingredients as you will be working in 2 batches. 2. Heat the wok over high heat. When it begins to smoke, add the peanut oil. Add the tofu and cook until golden. 3. Add the garlic, and cook for a few seconds. Add 2 handfuls of the squash, and cook through for about 30 seconds to coat them in oil. 4. Add about 3/4 of the vegetable stock, allow it to reduce. Check the squash to see if gets more tender. Add more stock if the noodle is still too firm. 5. Move the noodle/tofu mixture aside, and add a bit more oil to the wok. Add the egg and let it set for about 10 seconds. Scramble it and fold it into the noodle mixture. 6. Stir everything together to cook through, turn off the heat and add 4 tablespoons of the sauce. 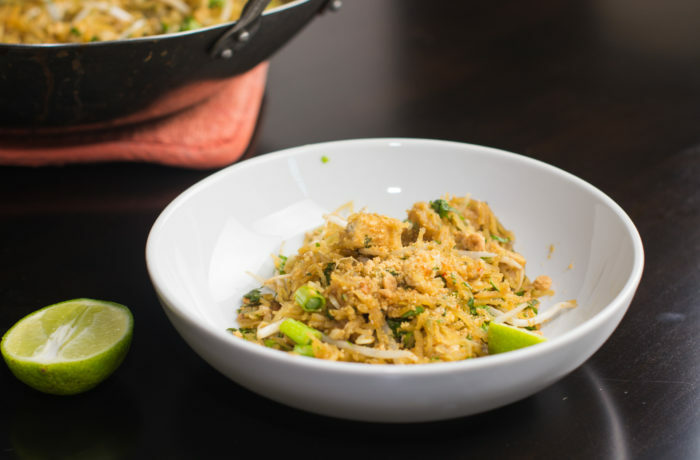 If you prefer your Pad Thai saucier, feel free to add more. Sprinkle with a few peanuts and toss. 7. Just before serving, add the green onions, a few sprouts, and fold everything together. 8. To garnish, top with peanuts, a squeeze of lime juice and chopped fresh cilantro. 9. Before you cook the second batch, line up your ingredients again: measure out the rest of the oil, crack another egg and have your stock ready. Rinse out the wok with warm water and wipe it clean with some paper towel. Follow the same order as before. Serve immediately once cooked. Feel free to serve with chili powder, lime, peanuts, and sugar on the side - the way it's done in Thailand!